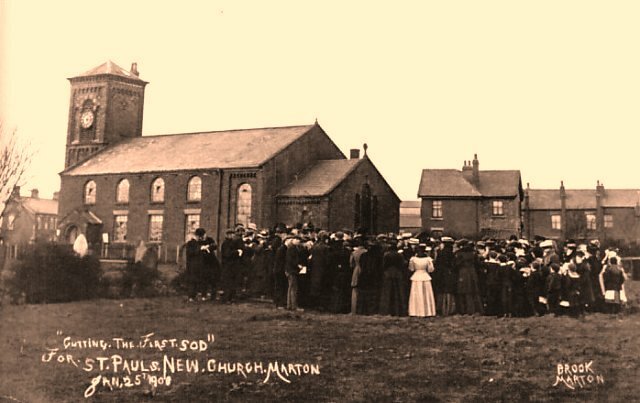 A newspaper article from 1909 on St.Pauls Church, Marton, Blackpool; the new church and the history of the old church. Photos have been added to the article. 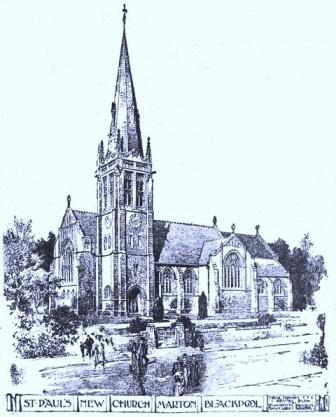 Architects impression of the new St.Pauls Church Marton, 1909. Old associations are not easily broken with, and while the worshippers at St. Paul's, the Parish Church of Marton, are looking forward with joy and thanksgiving to the consummation of their long-cherished desire, and the consecration by the Bishop during next week, of their beautiful new church, there will, no doubt be a sense of chastened joy to-morrow as they realise that they are worshipping for the last time within the walls, hallowed by many tender memories, wherein for over a century the Word has been so faithfully delivered to them and their ancestors week by week. The physical attractions and comforts of the new home will draw forth their praise and admiration, and give encouragement to faith and new endeavour, perhaps call forth even more devoted service, and attract new workers, but the dear associations of the old place will long linger in the minds of the older Worshippers. A significant passage occurs in the morning Psalm, which may strike an unusually impressive chord as it is recited in tomorrow morning's service: "in the day of thy power shall the people offer thee freewill offerings with an holy worship: the dew of thy birth is of the womb of the morning." What an appropriate text for such an occasion! more than a century ago, ere Blackpool the frivolous was born, when Marton Church was first opened for service may never be compiled. 'That a precious history surrounds the ancient pile is certain, and the vicar may unfold a. little of it in tomorrow's sermon. Meanwhile, a preliminary note or two may prove of interest to the general reader. Meretun, or the town of the Mere —as Marton was formerly known, dates back in historical records to the days of William the Conqueror, whose surveyor's estimated the "town" to comprise "six caracutes" of arable land. Shortly afterwards Sir Adam de Merton held half of it, on condition that be performed military service (when required. Somewhere about the year 1,200 William de Merton, a descendent of Sir Adam, was one of the witnesses to a charter, concerning a local marsh between Cecilia de Laton and the Abbot of Stanlawe. It would have been interesting—if space permitted to follow up this historical record, but for present we must leave the succeeding four-and-a-quarter centuries—readers anxious to trace the continuous record ...being referred to the published histories of the Fylde. About 1625 (says Porter, in thie "History of the Fylde") the inhabitants of Marton petitioned, that in conjunction with "Layton, Layton Rakes, and Blackpool," the township might be constituted a separate parish, stating in support of their prayer that the parish church of Poulton was five miles distant:, and during the winter they were debarred by inundations from attending that place of worship. This reasonable request, adds the historian, does not appear to have evoked a favourable response from the Parliamentary Commissioner's, and it was not until more than a century and a half later that the district had its claims to the privilege desired practically acknowledged. St.Pauls Church Marton, completed in 1800.
that the Church of St.Paul, at Marton, was erected by public subscription, and in the same year (1800) it was opened by license, though it was not consecrated until 1804. It was a plain, unpretending structure, with front and side galleries, but having neither chancel nor tower, and capable of holding upwards of 400 worshippers. The church tower and chimney stack. In 1857 the increase of the population rendered it necessary to lengthen the church at the east end, and at the same time - the neat and simple tower was added a tower which, provokes the comment of all beholders, by reason of the fact that it is surmounted by a chimney stack! Within the tower is the vestry, above which a number of seats were raised for the Sunday school children, many of whom had previously, for want of space, occupied forms in the aisles. A porch was built over the entrance of the church about 1848, and in 1871 a chancel was erected. 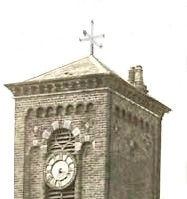 Three bells were purchased by the parishioners, and placed in the tower in 1868, whilst the reading desk and pulpit were the gift of Miss Heywood, daughter of Sir Benjamin Heywood, Bart., who formerly had a handsome marine residence at Blackpool. Previous to 1845 the musical portion of the service was accompanied by two bassoons and an other wind instrument, but these were superseded about the date named with a barrel organ! This continued in force until the beginning of the 'seventies, when it was replaced by the present organ. Originally as chapelry under Poulton, the church of Marton is now a separate ecclesiastical district. A little anterior to the erection of the old church, divine service was conducted in the school-house of Baines' Charity. An interesting article on the latter subject - descriptive and historical - appeared in the "Blackpool .Times" on July 15th, 1903. Mr. Sawyer, was the first appointed minister, about 1762; In 1772, Rev. George Hall succeeded, and he officiated for 42 years. At his death in 1814 he was succeeded by Rev. 'Thomas Bryer (or Briar), who officiated for 42 years. In addition to their other parochial duties, the curates-in-charge already named had to act as headmasters of the Baines Endowed School. On the resignation of Mr. Bryer, in 1843, Rev. James Cookson succeeded as curate-in-charge, and it was during his term of office that Marton became a separate parish, he being the first "incumbent of the parish." He retired after over fifty years faithful service, and his memory is honoured by old Martonians. He died on Tuesday, September 8th, 1903, at Ambleside, where he had resided after leaving Marton. His wife and several children died during his vicariate at Marton,. and are interred in the graveyard there. Coming as curate to Marton in 1841, when, as stated. 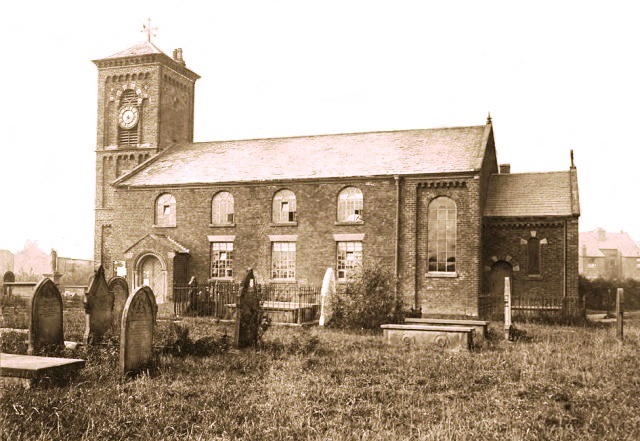 the place was a chapelry under Poulton, Mr. Cookson two years later became incumbent, and during his fifty odd service he saw and initiated many improvements in the parish. The old plain church was enlarged and a tower added in 1857 The chancel was built in 1871. After retirement of Mr. Cookson, the Present, (and first) vicar, Rev James Crabtree, was as appointed to the office. and what pen shall record the faithful service and devotion of his ministry? The time is not yet - may it be far distant - when an estimate and summary of his labours in the parish and for the parish can be properly made. afforded by Mr. J. P. Dixon and his family whose handsome contributions made the extension possible, nor the smaller, though not les self-sacrificing contributions of the humbler and poorer members of the congregation. Truly the financial response, so worthily inspired by the Vicar's appeals and encouraged by Mr. Dixon's princely munificence, have been creditable to the parish. enterprise drew together a good company of rejoicing supporters. For ten years previously the officials and congregation had been moving in the direction of securing a new church, all the time hampered with the difficulty of selecting and obtaining a suitable site for their new enterprise. and delivered a characteristic and broad-minded speech on the occasion, and placed a £50 note on the stone he had so well and truly laid." The joint architects for the handsome building were Messrs. Frank Gorst,, F. Freeman (Bolton), and William Cardwell. 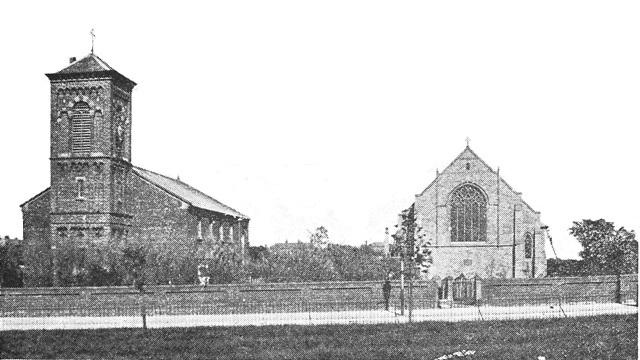 The new Church of St.Paul, built alongside the old church and consecrated by the Bishop of Manchester 28 May 1909.